From the playground at school to the tree in the backyard, kids love to climb. Why not add rocks to the list? If you’re looking for an activity that is new, exciting, and just a little bit different, rock climbing might be just the thing! 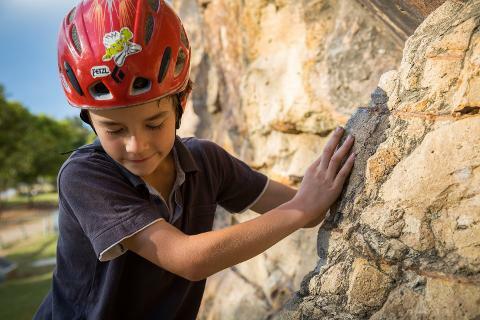 The fantastic cliffs of South East Queensland offer an incredible opportunity for kids to explore different styles of movement while engaging their natural curiosity. Climbing is an interesting combination of physical and mental challenges, and a route is both a test of skill and a puzzle to be solved. As they progress further and further each week, members of Kids Club gain a sense of achievement in a fun and non-competitive setting. They learn climbing techniques and safety skills from our stellar guides, and then learn to apply these skills on the wall. It doesn’t matter whether the goal is getting to the top, getting over a hard move, or just getting off the ground – climbing is a personal journey, and kids build confidence by setting and working towards their own goals. We love introducing kids to the rocks and watching as they go on to do amazing things. In the sport of climbing, a lifetime of adventure awaits. Why not get started now? Our awesome guides are highly trained, fully accredited, and heaps of fun! They’ll take care of all the ropes and rigging, as well as providing all the gear - harness, helmet, climbing shoes, and all other safety equipment. The kids will need a water bottle and snacks, appropriate clothing, and enclosed shoes for getting around the crag. Belaying is how we keep our friends safe as they climb, and learning this skill is an important part of climbing. At the start of each term, our guides will teach or refresh belaying skills, and everyone will take a competency-based belay test. From then, kids will be able to use our Grigris (assisted braking devices) to belay each other whilst anchored. For those under 12 years, or not able to pass the test, a parent will be required to help. The Kids Club Climbing Program runs for the course of a school term. Over 8 weeks, we cover three locations, each with their own distinct environment. 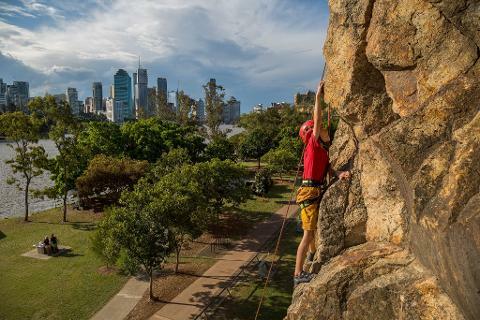 An unmistakable landmark and a true Brisbane icon, the Kangaroo Point Cliffs offer climbs for all levels of ability. 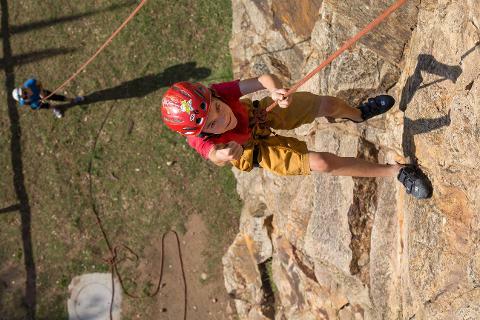 From the first day on the rock to the last day of term, kids are guaranteed to find a route with just the right level of challenge. 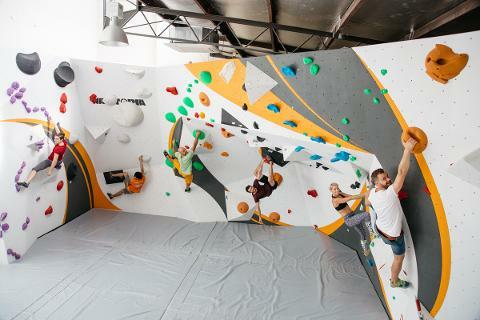 The controlled indoor environment makes it an ideal place for us to work on the finer points of climbing technique - rain, hail or shine! 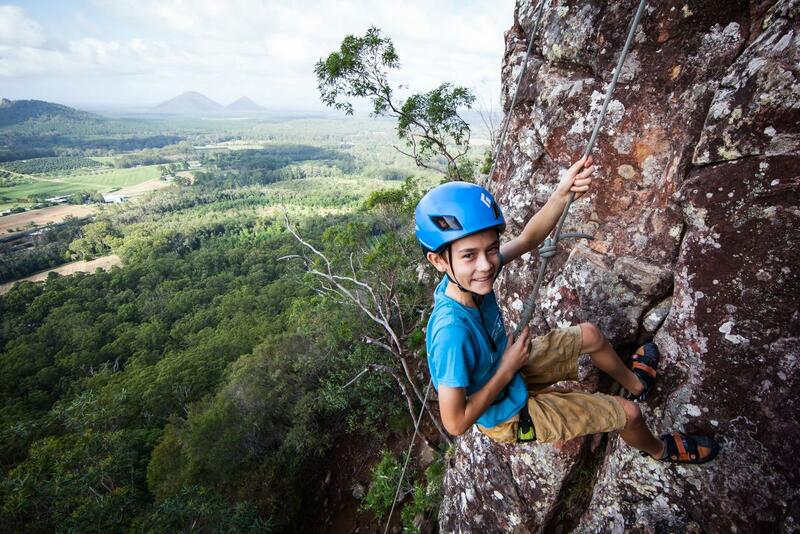 Located 60 minutes north of Brisbane, the Glasshouse Mountains are another iconic climbing venue. 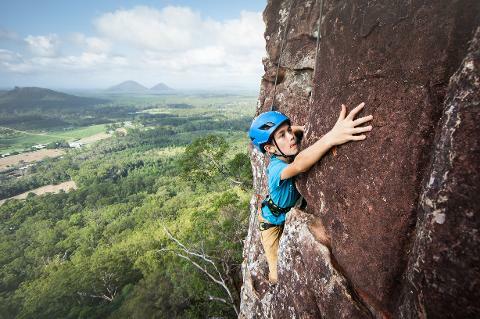 Mt Ngungun is an unforgettable introduction to climbing adventures in the Australian bush. Please consider whether your family can make the commitment to travel to these venues on Saturday mornings. As stated above, please also be aware that in some cases parent may be needed to assist with belaying. 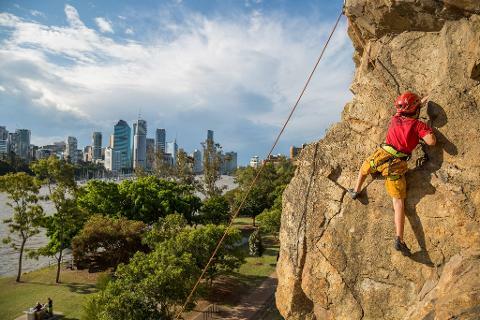 With more than 15 years of experience, Pinnacle Sports is South East Queensland’s leading provider of rock climbing and abseiling training and experiences. We work closely with Queensland Parks and Wildlife Service (QPWS) and other management organisations to ensure that our outdoor activities are fully permitted and environmentally sound. Our reputation for high quality outdoor experiences has been built on low instructor to participant ratios, meaning you get more time to do the rad stuff! Here at Team Pinnacle, we love all things vertical and we’re looking forward to sharing our passion with you. Kids Club is for participants aged between 6 and 16. 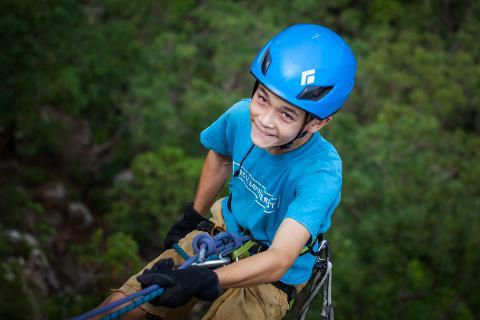 Participants under 12 years of age require a parent to assist with belaying. Please keep this in mind when booking your child in. Participants over 12 years who are not yet competent will also require an parent to assist with belaying. All participants require a waiver to be signed by a parent or legal guardian. Unfortunately, we are unable to offer a refund if your child cannot attend a particular session. If you know in advance that your child is unable to attend on a particular day, please contact us so we can let the guide know as a courtesy. In the event of wet weather, the session will be rescheduled. This generally means that if a session is washed out, we’ll run a supplementary session following the final week of the normal term schedule.